Unexpected new cabinet proposed for Lower Greenfield – a gift horse? BT Openreach are planning an unexpected new fibre broadband cabinet for Lower Greefield outside Greenfield Manor – but we don’t know how it is being funded or when it will go live. This cabinet has not been in any published OCC or BT plans (and still isn’t) so we presume it is the result of Connect8 campaigning. Our thanks go to whoever sorted this out – our elected representatives, Ed Vaizey or behind the scenes magic at BT. If it works this could bring superfast speeds to Howe Hill, Greenfield, Lower Greenfield and Britwell Hill. This is good news, even if the local phone lines that will distribute broadband from the cabinet are themselves are so knackered that it might not work – like upping the pressure on a leaky garden hose. This is all great for Connect8 including the radio solution we are working on. But at the risk of looking a gift horse in the mouth we retain a healthy scepticism about when and what this cabinet will deliver. Peter Richardson’s diligence unearthed the planning notification (it doesn’t need planning permission as it is telecommunications equipment). After some confusion, the original letter had the wrong location, outside the Christmas barn at Greenfield the location has been pinned down to outside Greenfield Manor. In all public plans hitherto, the most we were getting from OCC/BT Openreach was a modern replacement for (the completely full) ‘Cabinet 2‘ at Christmas Common maybe next year – far too far away to benefit Lower Greenfield, Howe Hill, Britwell Hill. Oxfordshire County Council BDUK – the people who give public money to BT to build cabinets in Oxfordshire – didn’t seem to know abut this new Lower Greenfield cabinet when Peter asked them. So this cabinet may be planned but not yet funded – generally BT Openreach charge about £40k for one of these we understand. We don’t know where the fibre will come from to feed the internet into this new cabinet. There appears to be an underground junction box at this point. BT Openreach will have to either flush out the existing ducting or dig a very long trench from Christmas Common or string it along some poles. Digging is astronomically expensive when BT does it – BT Openreach tried to charge me £54,763.37 ‘excess construction costs’ in 2013 for digging 2.5km of fibre to West Cottage (I demurred, the price also did not include VAT). The phone lines in the area are knackered and ill suited to carrying VDSL superfast signals. The whistling, cracking, popping and general low volumes on the voice lines are symptoms of damaged lines after years of neglected maintenance in our harsh local weather. I have three lines and two have not been working at all for weeks on voice, let alone broadband. There is also a shortage of new line pairs from Cabinet 2 at Christmas Common which is full. This doesn’t help good quality broadband and will diminish the theoretical figures for reach of superfast services. If the Lower Greenfield cabinet was plugged into good bits of copper then in theory, using this chart of how speeds fall as distance increases then ‘upper’ Howe Hill at 900 metres would get 30m/bs (if this is where they are fed from – there is some confusion), Greenfield at 690metres some 35Mb/s, the properties around the chicken farms on Britwell Hill at about 1.3km would get about 22mb/s and me stuck out at the end of the line at Britwell Hill 2km away about 18Mb/s. All theoretical, but even is diminished by line problems, much better than the proverbial slap in the face with a wet fish. 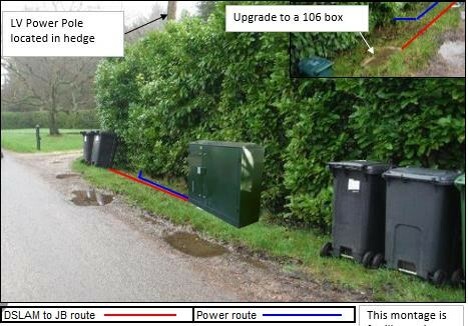 If this cabinet goes ahead it’s great for the wireless option for Connect8 as it brings fibre closer to the Britwell Hill masts which we can then relay on to people by radio, bypassing the problems with local phone lines and Heineken-like reaching the parts other technologies can’t reach. Suddenly Cookley Green would be in range of fibre only 1.45km from a cabinet. But it isn’t. In the crazy world of BT you aren’t allowed to switch exchanges – Cookley Green is fed from Nettlebed and must remain so. Or to put it another way another big slug of public money has to be spent to help Cookley Green because of a BT internal policy. This will be happening thousands of times across the country as the edges of ‘exchange areas’ are filled in, without being able to hold hands across boundaries. We have also heard of a new cabinet at the turn from the A4130 up to Huntercombe End and are checking to see whether this is new or already in plan and what impact it might have – more later. This entry was posted in Britwell Hill, Christmas Common, Cookley Green, Greenfield, Howe Hill, Swyncombe and tagged BT, cabinet.vdsl, dsl, lower greenfield. Bookmark the permalink. 2 Responses to Unexpected new cabinet proposed for Lower Greenfield – a gift horse? Disgraceful how councils can throw money at this obsolete fttc and call it ‘fibre broadband’. It isn’t fibre broadband if it comes down a phone line. amazing how these cabinets pop up where alternative networks are working. Anti comptetitive behaviour if you ask me.